7/31/08 Red and Black Drum and TEEEETH! 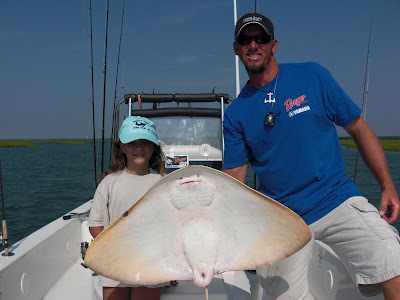 Well, this morning i had the pleasure of fishing with Dudley's own Melanie and her daughter, McKenzie. 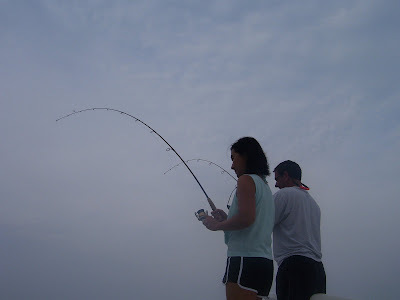 Melanie never gets a chance to take a break and McKenzie has only been fishing several times and was lacking the experience of catching a big fish so.... we tryed hard to change this... 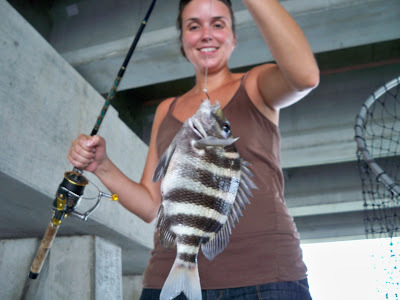 The tide was in the woods this morning (that means very high) and the redfish we were looking for were probably in the marsh so, after looking for an hour this morning we changed plans and went looking for black drum. The second stop was the ticket. 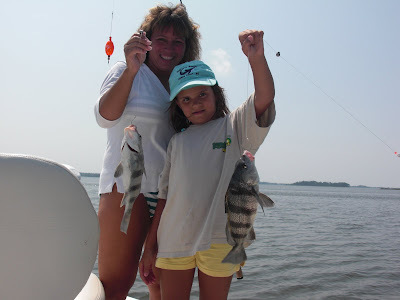 McKenzie and her mom quickly put up 5 black drum after feeding a few dozen shrimp to some scavengers. We let the tide get right and went looking for our redfish again... McKenzie was about to give up on a big fish when we struck Red and Gold! 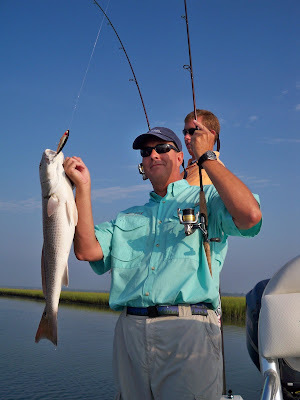 We set the powerpole down and started tossing into this small pod of Redfish. 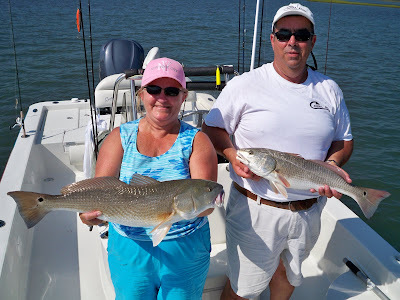 Melanie and McKenzie hooked up with and released about 8 Reds from 24 to 28in. We were running out of time and McKenzie really wanted to find some Sharks Teeth so, we left our redfish biting and made a very short stop on a good spot where McKenzie and I picked up about 15 sharks teeth. Great Job Girz! 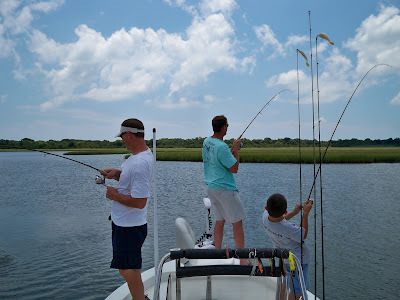 This morning was a different day... Cliff Horner and his family got onboard wanting to spend part of their day doing some serious fishing and then switch over to some Eco-tour activities. We often split a day to accomodate the different interests within a family. Anyway, we started out attempting to get this group onto some big reds. Ye Ha! 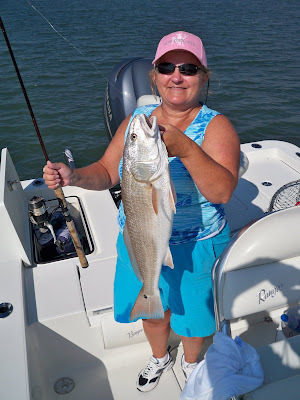 After an hour of searching... we cornered some redfish and took advantage of the situation! These guys (and Gal) took turns hammering the Reds! We released a bunch of overslot fish and they took a few slot fish home for supper! Afterwards, we made a stop and picked up over 100 sharks teeth! Great job guys! See ya next season! 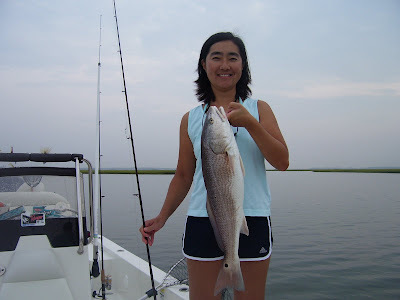 7/29/08 Searching the creeks for REDS! 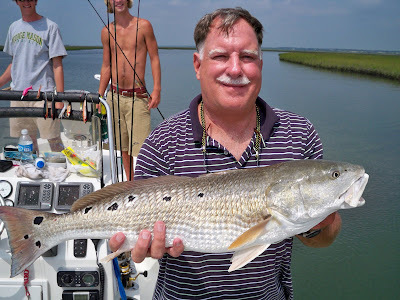 This morning I had the Carter crew onboard from VA hoping to get into the Ocean... but, the wind was already picking up at daybreak so they were more than willing to stay in the backwaters and search the creeks and flats for Redfish. 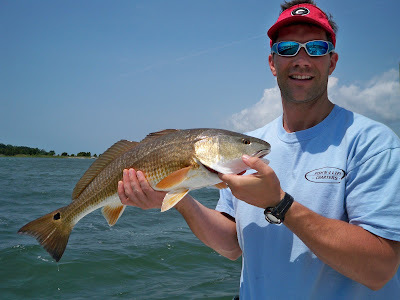 Well, shortly into our search we located a school of Redfish and we landed six nice Reds before we headed back to the dock. Thanks Guys and I look forward to having you onboard next season! 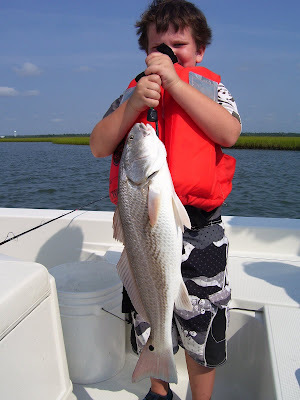 7/28/08 PM Trip - Little Man, Big Reds! 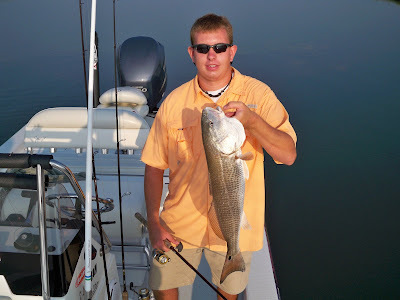 This afternoon I had Christopher and his father onboard for a few hours just before sunset to try out the redfish bite. 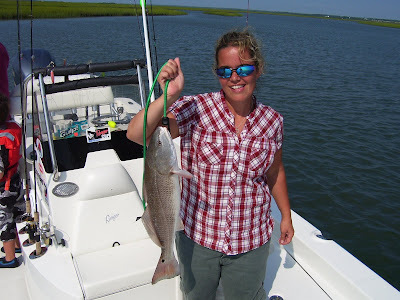 We spent about an hour searching the shallow flats before we were able to find a small school. We followed tracked them for a short while and were able to have fun fighting about a half dozen before they moved into deep water where we lost sight of them. Great Job Guys! See ya on the water! 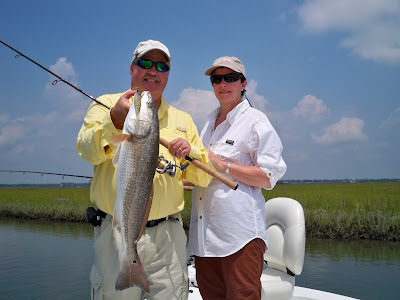 I had Rich and Audrianna on this morning and the weather was perfect for sightcasting to redfish in the backwaters. 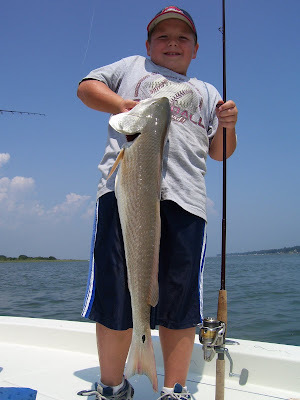 Lately, we've been finding good schools of redfish in Swansboro and Morehead City. 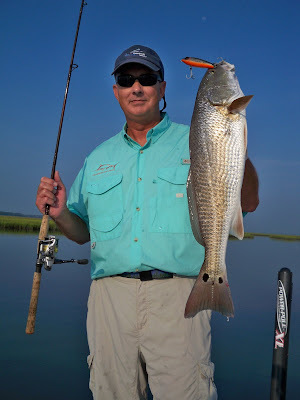 Today, on our first stop, we found redfish tailing along a grass flat and we began hooking up within the first few casts using topwater baits and Berkley Gulp Pogies fished on light jigheads. 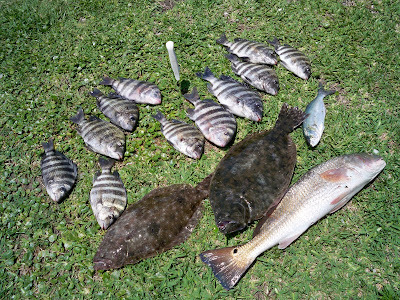 The tide dropped out very low today and these fish just shut down after we landed about 8 nice fish. 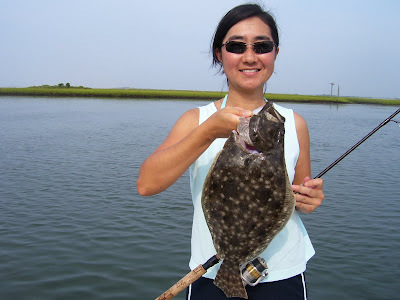 We moved on and worked some structure for flounder, landing 3 with the largest at 2.75lbs. 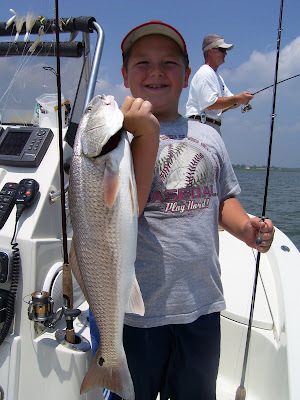 Then before we made our way back to the dock we found another school of redfish and hooked up with about a half dozen fish from 22in to 29in. Great Day guys! 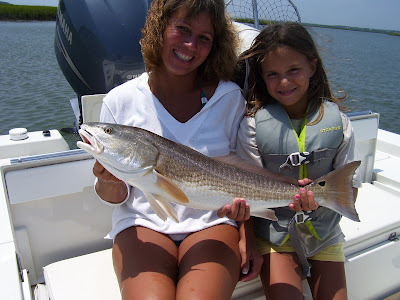 Congrats on your first redfish Audrianna! 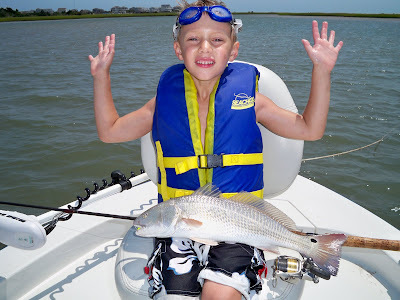 We had a great trip this morning as we headed out searching for redfish and flounder. 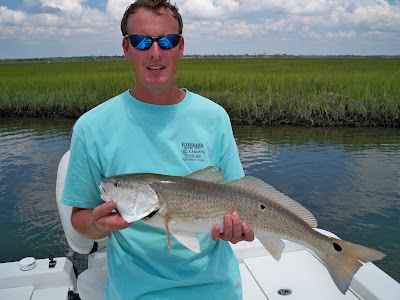 We started out chasing a small pod of redfish along a shallow grass flat in Queens Creek. We were able to hook-up 5 fish before the school quickly departed. 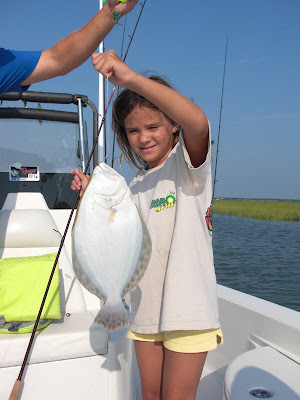 We moved on to some structure along the ICW and worked live baits for flounder. After a couple hours we were able to land 7 flounder with several nice fish! Great Job Guys! I hope the trip back to London is an easy one Peter. 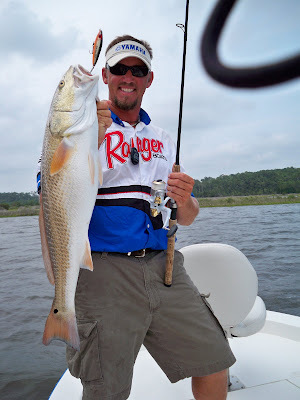 While filming our second show (CarolinaFishingtv.com) this past week on Wed. Capt. Mike Taylor landed a Doormat Flounder as we began the show. 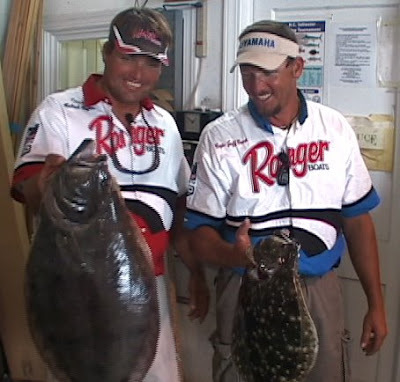 If you want to see some serious flounder action while we explain the techniques for catching these elusive flatfish, check out the next show on Fox 8/14 next sunday, Aug. 3rd at 9:30am. It's currently listed under paid programming. HEY FOLKS! CLICK ON THE PHOTO TO THE LEFT TO SEE THE TOURNAMENT VIDEO HIGHLIGHTS OF THE WEIGH-IN AND CEREMONY! 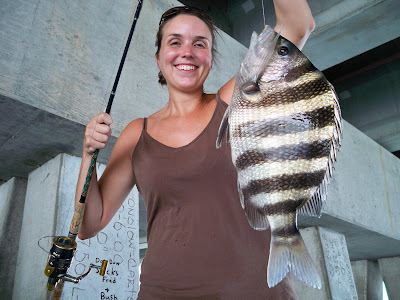 This afternoon we started out with some sheepshead fishing and the bite was steady. We fished for a couple hours and had about 50 strikes. Chicks definately rule today as Holly landed half of the fish brought aboard with the largest fish of the afternoon. 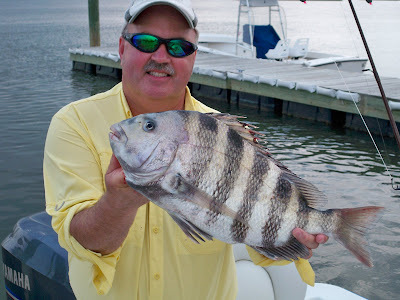 But,,,, Steve did catch the first Sheepshead. We spent the last hour looking for some reds. 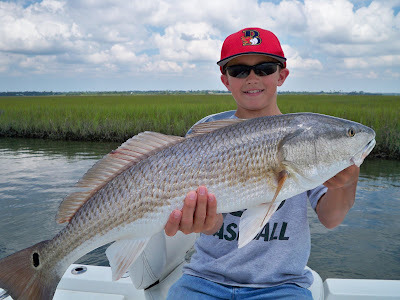 We located a school of about 100 reds on a large sand flat but after tracking these fish for 20min. and then forcing them into a deeper pocket in the back of the bay, a commercial fishermen came flying across the the bay, past our boat, and right next to the school of fish. They spooked and scattered and we moved into deeper water. Guess you can't win them all... sorry guys! 7/22/08 Reds! Reds! and More Reds! 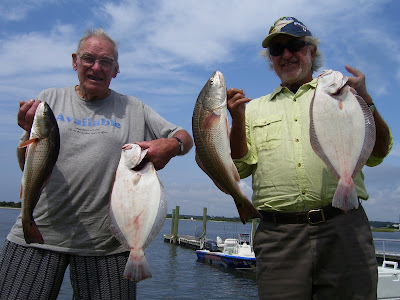 This morning I left the dock with Doyle T. and his son aboard and we made our way up Bogue Sound looking for some redfish. After a short while of looking we wound up on a decent school of fish that were blowing up on mullet minnows. We started tossing Berkley Gulp baits on jighead into the fish with consistent hookups and then switched over to topwater baits. 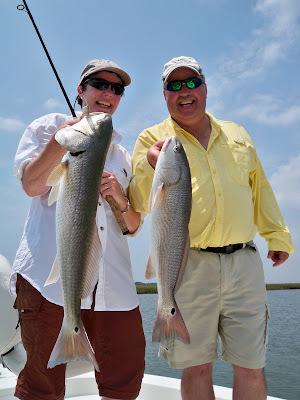 We had a ball for several hours and released about 15 redfish from 24 to 31in. 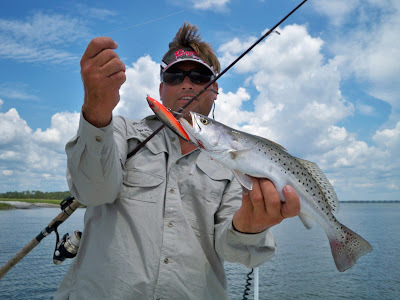 and a decent speckled trout. Our largest was around 10lbs. 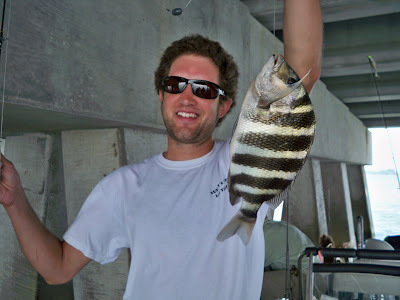 We moved on and gave the sheepshead a try. 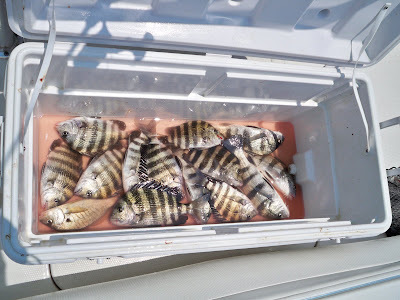 The bite was a little slower today but we caught 7 and kept a few for a stew. Great job guys! Fun as usual! 7/21/08 Looks like a Prison Break! I had Donald and Bill onboard this morning for some navigation direction and some fishing too. 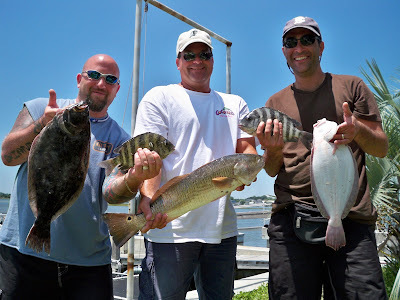 We spent some time floating live shrimp to black drum and also fed fiddler crabs to a mess of sheepshead. The bite was a little slow today after the tropical storm passed but these guys were still able to cover the bottom of the 120qt cooler. Great job guys! See ya again soon. 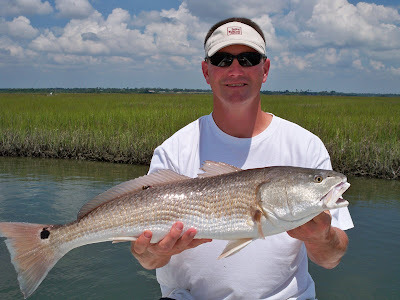 Carolina Fishing TV - New Saltwater Fishing Series! Hello everyone, I wanted to take a moment to share some good news with you. I've been working with good friend Darryl M. for some time now and we've been working on putting together a new fishing television series. He's appropriately named it Carolina Fishing TV and our first show was covering footage aboard my boat with Myself (Capt. 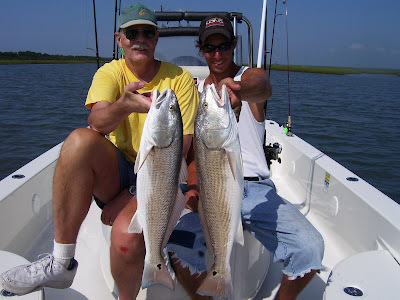 Jeff Cronk) and Capt. 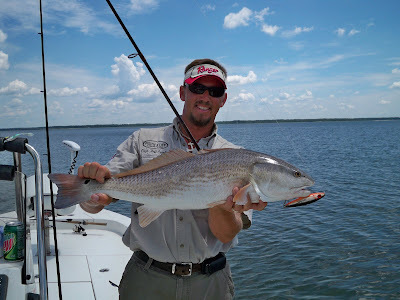 Mike Taylor during the first CCFA Redfish Tournament of the season on June 21st. The first show aired Sunday, July 20th at 9:30am on Fox 8/14. I believe it will play again next Sunday morning and we've got a bunch of Sunday morning lined up to do more that tournament coverage. 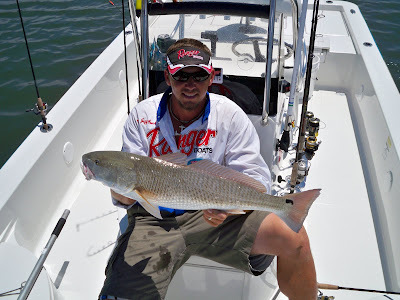 We're going to show you some great inshore/nearshore fishing along the Crystal Coast along with some how too's and rigging tips. 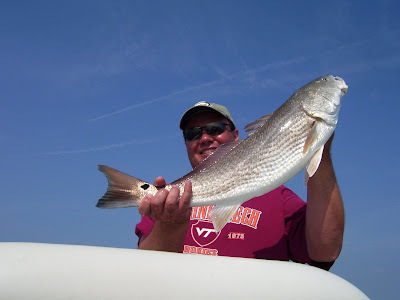 Check out the show's website for more information at www.Carolinafishingtv.com and click on current show to view the scaled down version of the show. 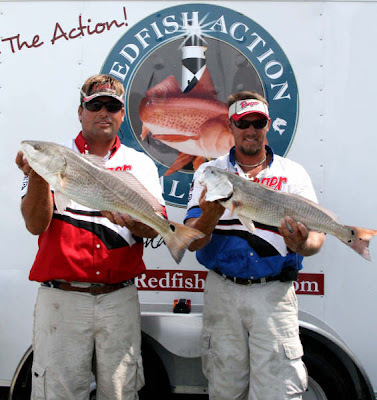 IFA REDFISH TOUR- SAVANNAH EVENT- 5TH PLACE "ATLANTIC DIV. 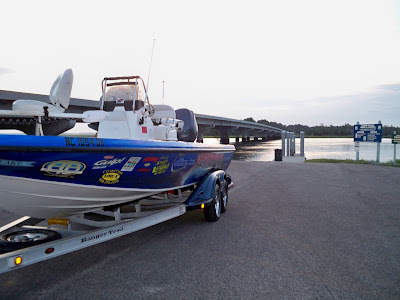 TEAM OF THE YEAR"
Well, I've tryed to get more of the pics off the camera from our recent trip to Savannah, GA for the third and final tournament of the IFA Redfish Tour's Atlantic Division. The upper end of the slot limit in GA is 23in. and Mike and I found a school of about 50 to 75 fish ranging from 19 to 27in. with alot of upper slot fish. We had this spot to ourselves for tournament day which was great! The tide got right on our spot about 12pm and we had to leave for weigh-in at 1:45. We caught and released 18 slot reds during that period and managed to put a 22.5in fish and a 21.5in. fish in the livewell. 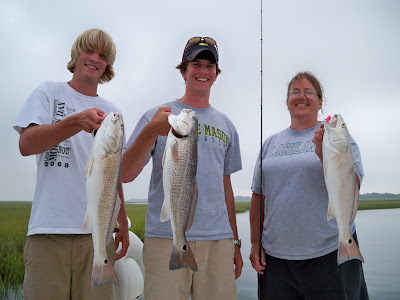 Over the course of the day we caught a mess of speckled trout, shovel-nosed sharks, ladyfish, and a few large redfish! 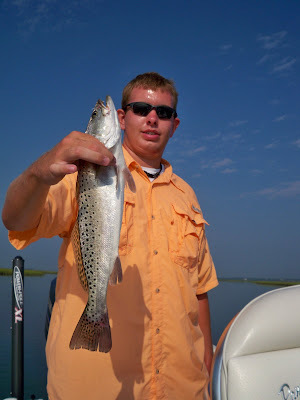 Awsome fishing with a lot of backwaters. It was a tough mental game fishing this tournament when neither Mike nor I have ever navigated or fished these waters. That's the beauty of these tournaments, it only takes a few fish to earn a high ranking in the event. 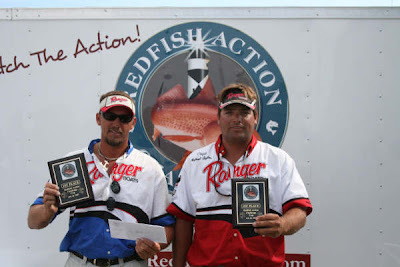 Mike and I earned 5th place in this event with 2nd place largest fish. Our top 5 finish also earned us the points we needed to complete the Atlantic Division as Team of the Year. Thanks to everyone with the IFA organizing this series and congrats to all the anglers who managed to bring fish to the scales. Mike and I are looking forward to fishing the IFA National Event in Panama City in November. If anyone has any general information, whether fishing related or with accomodations, please email or call me. We are willing to trade out some fishing back here in NC. Capt. Mike Taylor and myself will be heading down to Savannah the middle of next week to fish the IFA's third and final tournament of the Atlantic Division. We are currently in the lead for Team of the Year for that division but,,, it's gonna be tough as like the Charleston Event, we have never fished Savannah, Ga. We haven't had any time to go down and prefish and aren't sure where we want to stay, North or South of the tournament site. But, we want to participate and show our support in the series. It would be nice to find some reds though... especially when you're spending a few grand to make the trip. 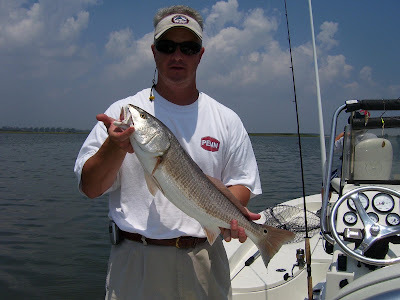 If anyone has any information regarding areas from Beaufort/Hilton Head to Savannah that consistantly hold upper slot reds from 20 to 23in., decent Ramps for those areas, and decent hotels on the water or near-by those ramps, please feel free to give me a call at 336-558-5697. I've taken a couple days off as my sister, Laurie, came to town along with her husband, Todd, and their son, Hunter. Todd and I went to drop the boat in the water in preparation for a day on the water with the families but.... you know me... 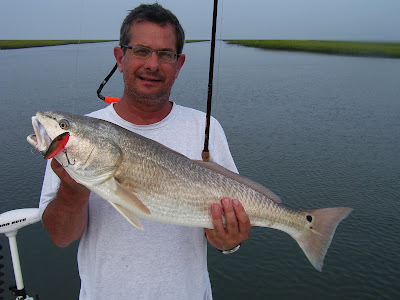 I couldn't stand the temptation... Todd and I had to make a couple of quick stops and work over a few Redfish. 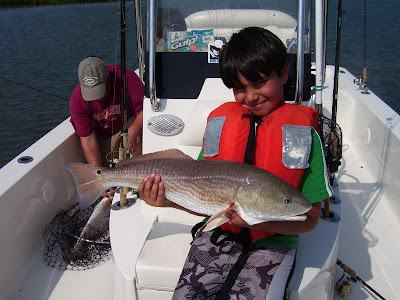 Todd picked up this nice 29in Red and little man got a perfect 21n Pup. We made it back with plenty of time to pick up my sis and hit the sandy beach like everyone else for the holiday.